Recently I was looking up details of a clockmaker named John Buffett of Colchester. The place to find details of any Colchester clockmaker is that excellent and lavishly-illustrated book, Clock and Watchmaking in Colchester' by the late Bernard Mason. Born in 1895, Bemard Mason began collecting Colchester clocks in 1927. He eventually built up a collection of 215 clocks by Colchester makers, which collection he bequeathed to the town for public access, along with the building containing them, called 'Tymperleys'. Today I understand this building is closed to the public. Mr. Mason was 74 years old when his book was published in 1969. He was a kindly man, who helped me once or twice with the loan of photographs. Sadly he died in 1981. I remember to this day buying my copy of that book. The price then seemed very heavy at 84 shillings (£4.20p), which was a very odd price and presumably represented a currency then pretty well out of fashion except in occasional auction houses, that of guineas. Four guineas was four pounds four shillings. I remember being delighted with my copy, not just because it was a fine book in its own right, but for another, more devious reason. At that time I was desperately looking for a publisher for my first book, 'Yorkshire Clockmakers'. I considered that if a publisher was willing to print a book with 373 photographs about the clockmakers of a single provincial town, how much more saleable would they regard mine, which covered almost two thousand clockmakers in an entire county! I rang the publishing editor at Country Life Books, then part of the Hamlyn empire. You know how you get that feeling sometimes that the person you are talking to has his head in his hands and keeps swallowing handfuls of anti-depressant pills as you speak.....? 1. 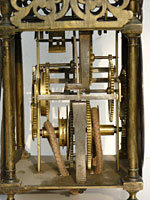 This lantern clock by John Buffett of Colchester is one of only six known by this maker. It has the original hand. Date 1715-20. He told me that the Colchester book had been a terrible mistake, a financial disaster, was selling badly, and that - I remember is words exactly - he never wanted to hear the word 'clock' again as long as he lived! Bit of a setback for me. I seem to recall they later sold the book off cheaply to clear the stocks. Today a second hand copy could set you back almost a hundred guineas. Well Bernard Mason was very thorough in his researches, and, with his wife's help, they have detailed pretty well all that could be found about John Buffett, leaving precious little for me to do. He was baptised on the 20th April 1692 at the church of St. Mary on the Walls, Colchester, to parents John Buffett senior (a musician) and his wife, Bridget. I found that in 1695 they had another son baptised there, named Tristram, of whom nothing more seems to be heard, so perhaps he died in infancy. Mason was puzzled by his discovery of a very strange apprenticeship indenture dated 27th January 1707 by which John junior was bound for seven years to Charles Ward, 'cordwainer'. A cordwainer was not, as we might expect, a ropemaker, but a maker of fine leather goods such as shoes, and a craftsman who was way ahead of a mere cobbler. He certainly had the right John Buffett, and John Buffett certainly learned to make excellent clocks in the finest tradition. So how to explain this strange apprenticeship? Well, I can't explain it either, unless perhaps Charles Ward was a member of the Cordwainers' Company of London. He is not recorded as a known clockmaker, but he might well have been, as previously undiscovered ones come to light almost every day. A craftsman need not necessarily follow the craft of the Company he belonged to. A tradesman could, and often did, join a Company unrelated to the craft he plied, especially if some relative, such as a father, has belonged to that Company. Mason suggests that maybe young Buffett dropped out of that apprenticeship and took up another, as yet undiscovered - and that is possible too, but we may never know. However it happened we do know that he was an established clockmaker by 1723, and quite possibly by 1715, as Mason suggests. He never married, which means that all we know of his life are titbits of information Mason gleaned from local city records - trading without freedom in 1725, taking up freedom in 1728, jury service from 1729 to 1740, voting in the elections of 1734, 1741, 1747. In February 1756 he advertised in the Ipswich Journal strenuously denying reports he described as false, put about 'by some evil disposed persons', that he was going to give up the trade. This referred to local clockmaker Edward Houghton, who too took out an advertisement stating it was true because Buffett had told him so himself! Sure enough in November of that same year John Buffett retired. He was perhaps in ill health as he died on the 9th of May 1758, being buried in Colchester churchyard. 2. 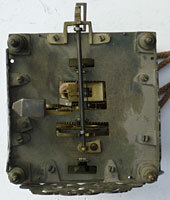 This left view of the movement shows the original wheelwork, the wheels with shallow domed brass collets. Bernard Mason kept a record of the number of clocks he had seen over the years by John Buffett. They amounted to 37. Of these only three were lantern clocks and three were thirty-hour longcase clocks. All the rest were eight-day longcases, except two that were bracket clocks. The conclusion he drew from this analysis was that Buffett aimed his work principally at the upper end of the scale, the eight-day customer. He suggests that the reason behind this was probably that he came onto the scene some years after John Smorthwaite, who began work there between 1708 and 1710, and that, by the time of his starting work, Smorthwaite had already captured the cheaper end of the market. I don't quite see this, as Mason also records that of 45 clocks known to him by Smorthwaite, 29 were eight-day examples. But Mason records that for his first few years Smorthwaite concentrated largely on thirty-hour clocks, both longcase, and lantern, of which latter Mason recorded 16. I have come across a number of clocks by John Buffett over the years but did not record their numbers, other than for his lantern clocks. On to Mason's count of 3 lantern clocks, I can add three more - one that was later converted to a spring movement, another with original anchor escapement, and the third one pictured here. So we have six known lantern clocks by John Buffett, and these all fall in the earlier part of his career, say between 1715 and 1725. It seems to me that the reason John Buffett's lantern clocks were few in number and were made early in his working life was that the lantern clock was rapidly becoming outmoded by the 1720s. Smorthwaite made more because he was working from an earlier period before tastes changed. Thirty-hour clocks fell within the earlier working life of both clockmakers, because in the early eighteenth century clocks were still costly, new-fangled luxury items that rural homes had always managed without. At a time when clockmakers struggled to sell any clock, they had more chance of selling a lantern clock or thirty-hour longcase because they were considerably cheaper than an eight-day. 3. This view of the top plate of John Buffett's clock shows the anchor escapement in more detail, the hammer positioned on the left as was normal. But there was perhaps another reason. John Buffett was the son of a musician, who would have been known amongst the more refined ranks of local society He was born and grew up within a circle of more prosperous people who might have formed a nucleus of clients and furthermore as a man who never married, he might have been seen as an eligible bachelor and a likely marriage prospect. And he was local. John Smorthwaite was born in Lancashire, trained in county Durham, arrived in Colchester about 1708 as a widower with a young child and no doubt a strong northern accent, which we in Yorkshire sometimes struggle to understand to this day, so heaven knows what the good folk of Colchester made of it. I wrote an article about John Smorthwaite in Clocks Magazine for May 2005. Mason comments that Smorthwaite appeared to have lived as a bit of a recluse for many years, till he eventually re-married in 1722 at the age of 47. This is understandable when we know that he had a dark past to hide, as his father had been imprisoned when John was a young child, and eventually had been hanged in 1684 for highway robbery, soon after which John had been sent to live with relatives far away from the area. He probably moved to Colchester to get as far away as possible from the locality of his family shame, and it is likely that John Smorthwaite's shameful background remained unknown in Colchester. Bernard Mason recounts that he knew from a descendant's researches that John Smorthwaite was born in Lancashire in 1675, but he searched for years to uncover his missing period without success, and to fathom why he came to work in a place so distant as Colchester. I am sure he would have been fascinated to know. These two factors, that John Buffett was more socially acceptable than Smorthwaite, especially in the moneyed society that included clock buyers, and that he worked at a later period when lantern clocks were falling from fashion, probably account for how few he appears to have made. John Buffett's scarce lantern clocks are amongst the last made in the locality, which makes them the more interesting because of it.